Raltegravir (MK-0518) is a potent integrase (IN) inhibitor for WT and S217Q PFV IN with IC50 of 90 nM and 40 nM in cell-free assays, respectively. It shows greater than 1000-fold selectivity for HIV-1 IN over several related Mg2+-dependent enzyme such as HCV polymerase, HIV reverse transcriptase, HIV RNaseH and human α-, β-, γ-polymerases. a: HCV, hepatitis C virus; HBV, hepatitis B virus. B: PI, protease inhibitor; NRTI, nucleoside reverse transcriptase inhibitor; NNRTI, nonnucleoside reverse transcriptase inhibitor; IN, integrase inhibitor. c: n=3. d: The EC50 for samatasvir in the presence of 45% human serum was 25 pM. Antimicrob Agents Chemother, 2014, 58(8): 4431-42. Raltegravir (MK-0518) purchased from Selleck. Vet Microbiol 2011 152(1-2), 165-8. Raltegravir (MK-0518) purchased from Selleck. The 1st approved human immunodeficiency virus type 1 (HIV-1) integrase inhibitor. For quantitative strand transfer assays, donor DNA substrate is formed by annealing HPLC grade oligonucleotides 5′-GACTCACTATAGGGCACGCGTCAAAATTCCATGACA and 5′-ATTGTCATG GAATTTTGACGCGTGCCCTATAGTGAGTC. Reactions (40 μL) contains 0.75 μM PFV IN, 0.75 μM donor DNA, 4 nM (300 ng) supercoiled pGEM9-Zf(−) target DNA, 125 mM NaCl, 5 mM MgSO4, 4 μM ZnCl2, 10 mM DTT, 0.8% (vol/vol) DMSO, and 25 mM BisTris propane–HCl, pH 7.45. Raltegravir is added at indicated concentrations. Reactions are initiated by addition of 2 μL PFV IN diluted in 150 mM NaCl, 2 mM DTT, and 10 mM Tris-HCl, pH 7.4, and stopped after 1 hour at 37 °C by addition of 25 mM EDTA and 0.5% (wt/vol) SDS. Reaction products, deproteinized by digestion with 20 μg proteinase K for 30 minutes at 37 °C followed by ethanol precipitation, are separated in 1.5% agarose gels and visualized by staining with ethidium bromide. Integration products are quantified by quantitative real-time PCR, using Platinum SYBR Green qPCR SuperMix and three primers: 5′-CTACTTACTCTAGCTTCCCGGCAAC, 5′-TTCGCCAGTTAATAGTTTGCGCAAC, and 5′-GACTCACTATAGGGCACGCGT. PCR reactions (20 μL) contained 0.5 μM of each primer and 1 μL diluted integration reaction product. Following a 5-min denaturation step at 95 °C, 35 cycles are carried out in a CFX96 PCR instrument, using 10 seconds denaturation at 95 °C, 30 seconds annealing at 56 °C and 1 minutes extension at 68 °C. Standard curves are generated using serial dilutions of WT PFV IN reaction in the absence of INSTI. 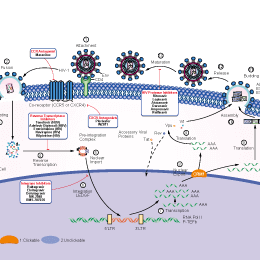 Human MT-4 cells are infected for 2 hours with the SIVmac251, HIV-1 (IIIB) and HIV-2 (CDC 77618) stocks at a multiplicity of infection of, approximately, 0.1. Cells are then washed three times in phosphate buffered saline, and suspended at 5 × 105/mL in fresh culture medium (to primary cells 50 units/mL of IL-2 are added) in 96-well plates, in the presence or absence of a range of triplicate raltegravir concentrations (0.0001 μM -1 μM). Untreated infected and mock-infected controls are prepared too, in order to allow comparison of the data derived from the different treatments. Viral cytopathogeniciy in MT-4 cells is quantitated by the methyl tetrazolium (MTT) method (MT-4/MTT assay) when extensive cell death in control virus-infected cell cultures is detectable microscopically as lack of capacity to re-cluster. The capability of MT-4 cells to form clusters after infection. Briefly, clusters are disrupted by pipetting; and, after 2 hours of incubation at 37 °C, the formation of new clusters is assessed by light microscopy (100 × magnification). Cell culture supernatants are collected for HIV-1 p24 and HIV-2/SIVmac251 p27 core antigen measurement by ELISA. In CEMx174-infected cell cultures, which show a propensity to form syncytia induced by the virus envelope glycoproteins, syncytia are counted, in blinded fashion, by light microscopy for each well at 5 days following infection. Hare S, et al. Proc Natl Acad Sci U S A. 2010, 107(46), 20057-20062. Hicks C, et al. Clin Infect Dis. 2009, 48(7), 931-939. Moss DM, et al. Antimicrob Agents Chemother. 2012, 56(6), 3020-3026. Hare S, et al. Mol Pharmacol. 2011, 80(4), 565-572. Lewis MG, et al. Retrovirology. 2010, 7, 21. 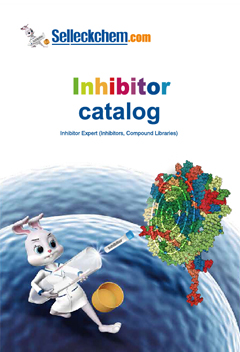 Cabotegravir (GSK744, GSK1265744) is a long-acting HIV integrase inhibitor against a broad range of HIV subtypes, and inhibits the HIV-1 integrase catalyzed strand transfer reaction with IC50 of 3.0 nM. Phase 2. Elvitegravir (GS-9137, JTK-303) is an HIV integrase inhibitor for HIV-1 IIIB, HIV-2 EHO and HIV-2 ROD with IC50 of 0.7 nM, 2.8 nM and 1.4 nM in cell-free assays, respectively. BMS-707035 is a specific HIV-I integrase (IN) inhibitor with IC50 of 15 nM. Phase 2. Dolutegravir (GSK1349572) is a two-metal-binding HIV integrase inhibitor with IC50 of 2.7 nM in a cell-free assay, modest activity against raltegravir-resistant signature mutants Y143R, Q148K, N155H, and G140S/Q148H. Features:A next-generation and two-metal-binding HIV integrase strand transfer inhibitor. Maraviroc is a CCR5 antagonist for MIP-1α, MIP-1β and RANTES with IC50 of 3.3 nM, 7.2 nM and 5.2 nM in cell-free assays, respectively.